Sarah is the Nurse Manager/Egg Donation Coordinator and brings twenty years’ nursing experience to the Herts & Essesx team. Fully trained in fertility, she was instrumental in setting up their egg sharing and surrogacy programmes. She looks after the day-to-day management of the clinic, carries out ultrasound scans, runs the surrogacy programme and helps Sarah Robinson run the egg donation programme. 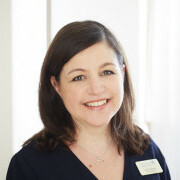 Sarah has been with Herts & Essex Fertility Centre since 2005.